Kim Kardashian was reportedly outraged this week when she realised there would be a celebrity reality TV format that she couldn’t star in. Friends and other highly paid hangers on rallied around the rounded rear reality socialite to look at potential husbands. 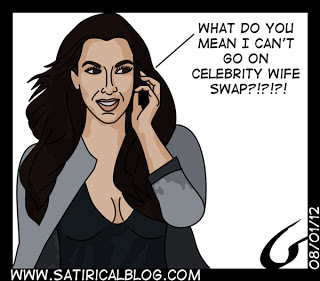 Producers of Celebrity Wife Swap have given Ms Kardashian until spring to get hitched with a view to include her in an Easter special. Front runner to join the Kardashian empire is Kanye West, with the hope he will change his name to Kanye Kardashian and help promote brand Kardashian. I would actually LOVE it if Kanye changed his name to Kanye Kardashian. We can call them KKK, you know, like TomKat. Kanye and Kim Kardashian. But I think she somehow just doesn't look stupid enough, but its hard to draw what she is I guess. yeah you could be right, so would that put me a league above then? Kanye Kardashian Klothing. KKK. Ironically befitting of the most racist man I know. lol @ Beer for the shower's comment. KKK also = Krusty's Komedy Klassics. Kanye Kardashian……a perfect candidate for the Antichrist. This is the silliest thing I have heard in years! I don't know if thats a good thing or a bad thing! The idea of the swap is slightly disgusting for my tastes. anyone else getting tired of Kim K? Hilarious! Kim K. is such a glory(hole) hound. She thinks everyone should have their fingers (or whatever) in her famous pie. How she quickly rose to the titles of "Has Been" and "Never Was", only the entire intellectual community really knows.